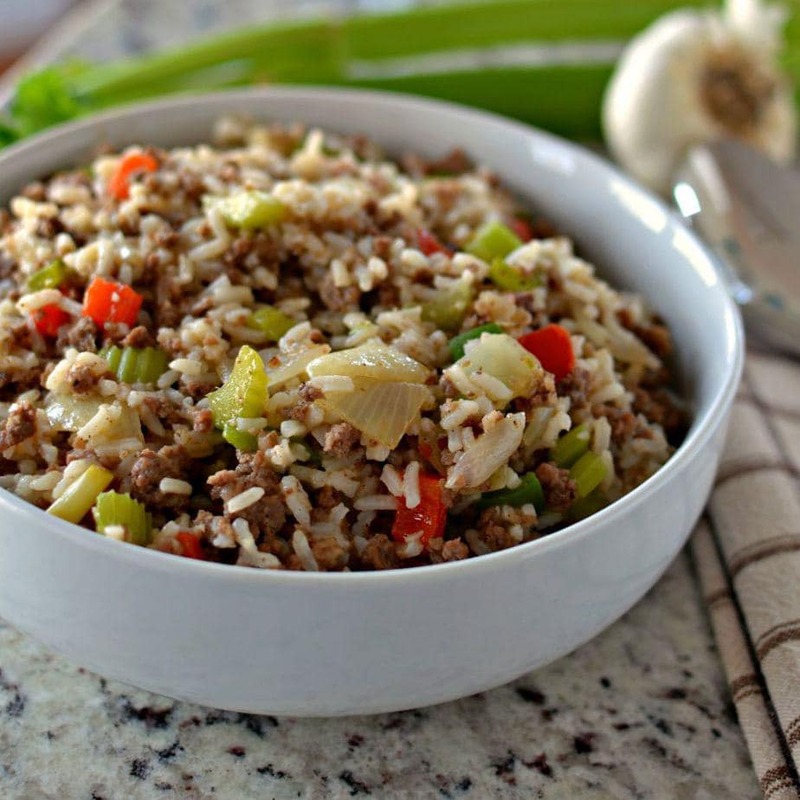 Dirty Rice is a delectable combination of ground pork, ground beef, finely minced chicken livers, rice, onions, celery, green pepper, garlic and Cajun seasoning. It is a complete meal that can be cooked up in about twenty five minutes. It is so full of flavor and absolutely delicious!! Do you like Cajun cooking and recipes? Hubby and I just love it. Cajun cooking is so full of flavor with down to earth good wholesome ingredients. You are going to love this Dirty Rice. This recipe takes less than thirty minutes to prepare, is a family favorite and one my most beloved Cajun dishes. 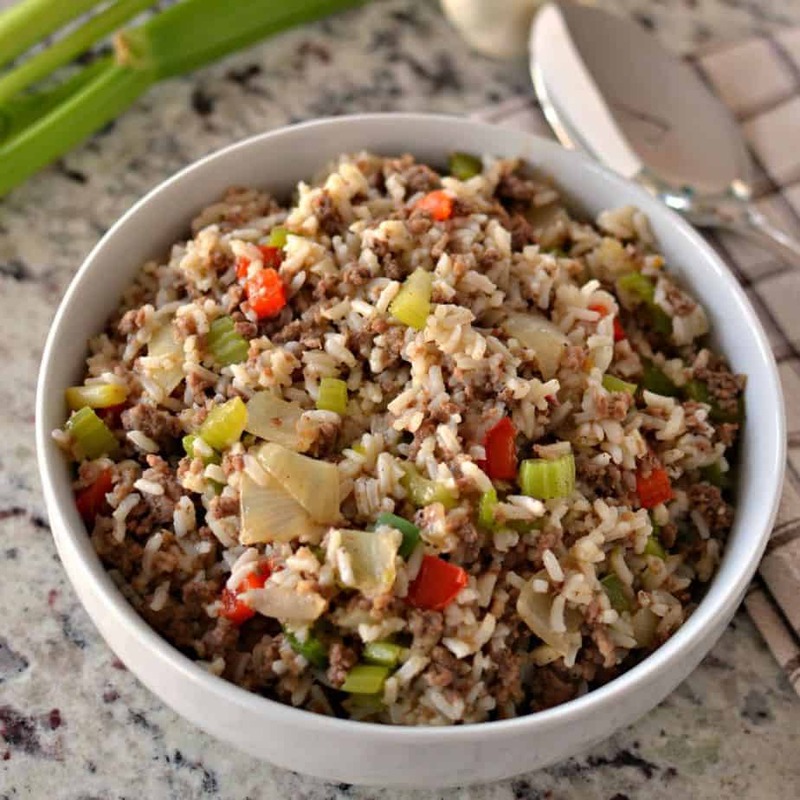 The dish combines the full flavors of the “Cajun Holy Trinity” with ground beef, ground pork and minced chicken livers. You don’t like chicken livers? Then go ahead and omit them. Cooking is about adapting a recipe to your own personal preferences. Oh boy! Did I mention that hubby and I just love Cajun food! 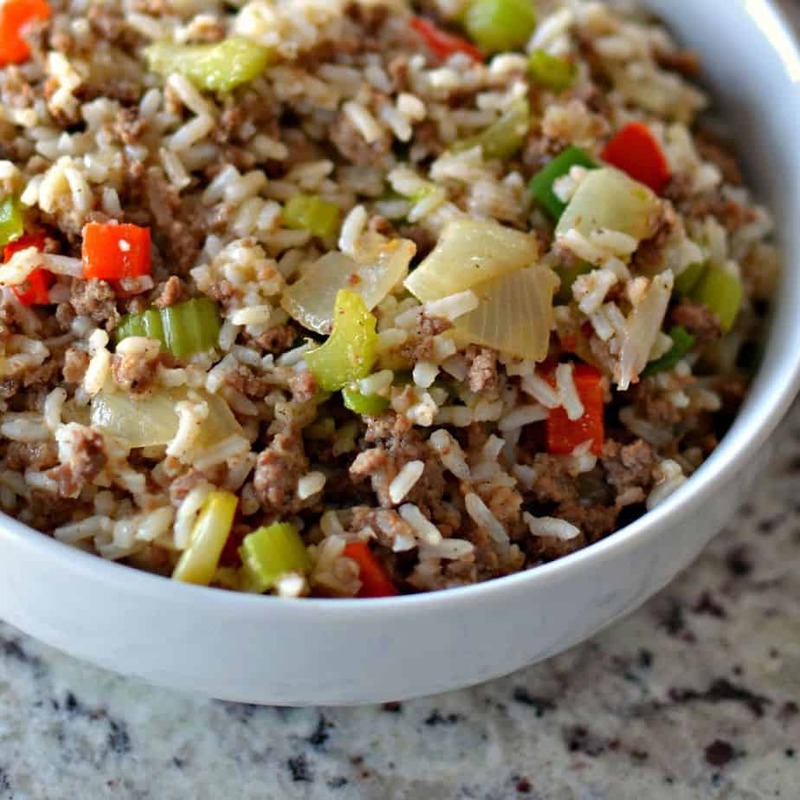 Dirty Rice is one of our favorites and so easy to whip up. It is a full meal in itself and if you are in hurry cook the rice ahead of time and refrigerate it. You will need to heat it up in the pot with the meat and vegetables for one to two minutes longer but it will still be delicious!! 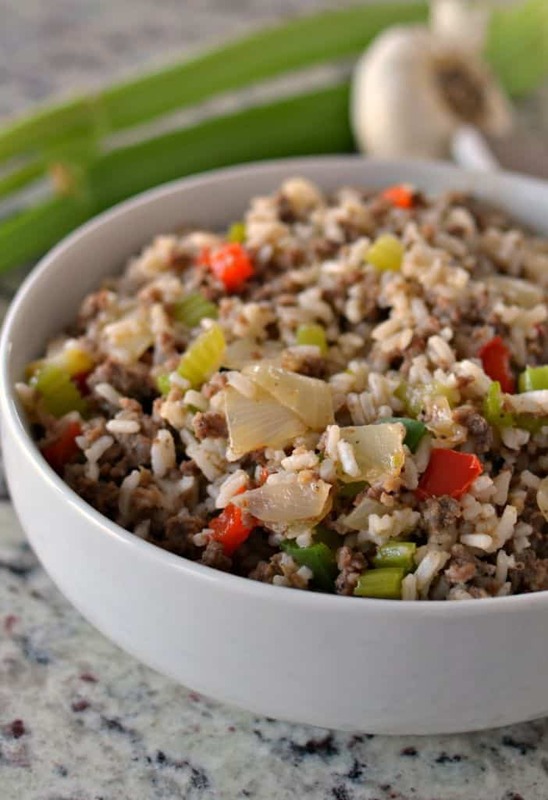 Dirty Rice is a traditional Louisiana dish consisting of white rice, ground pork, ground beef, chicken livers, onions, bell peppers and celery. It is then seasoned with tradition Cajun spices. The name is derived from the white rice looking “dirty” after the other goodies are added. Cajun Holy Trinity in Cajun cooking refers to onions, bell peppers and celery. This trio is a base in many delicious Cajun recipes like jambalaya, gumbo and crawfish étouffée. Have you tried my Easy Chicken Gumbo Soup? How to make Dirty Rice? First cook the rice by bringing it, some chicken broth and water to a boil. Cover with a tight fitting lid and reduce to a simmer. Cook for about fifteen minutes or until all the liquid is absorbed. Then grab a heavy stock pot or dutch oven. Over medium heat brown the ground pork and ground beef. When the meat is about halfway through the browning process add the minced chicken liver, onions, bell peppers and celery. Cook until the meat is browned and the vegetables are starting to soften. Stir several times. Reduce the heat to low. Add the garlic and the Cajun seasoning. Cook for about one minute stirring frequently. Finally add the cooked rice to the pot with the meat and vegetables. Stir in one half cup of chicken broth. Serve promptly. 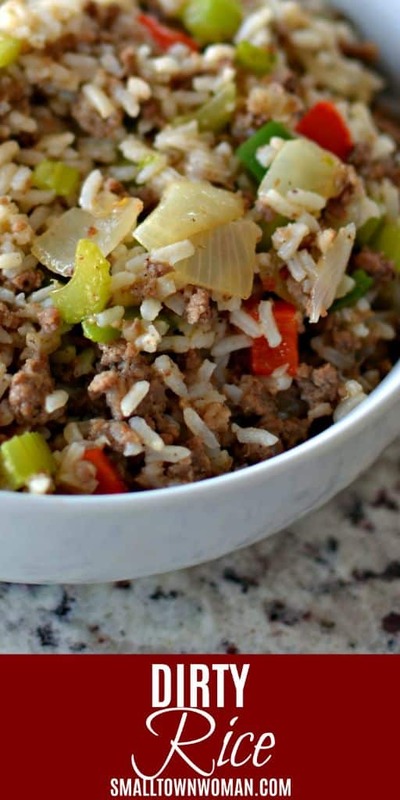 Helpful hints for making this Dirty Rice. Don’t lift the lid while cooking the rice. You want the rice to maintain an even temperature throughout the pot. In a hurry? Make your rice a day ahead of time and store in the fridge. You will need to add one to two minutes of reheating time when you mix the cold rice into the meat and vegetable mixture in the final phase. If you don’t like chicken livers omit them. The recipe is also scrumptious without them. If at all possible use fresh vegetables for this recipe. Cut your veggies in a small dice and slice. After all this is a rice dish so you don’t want big chunks. Add enough Cajun seasoning to suit your individual taste. If your palate is sensitive add one teaspoon. You can always add more in the last step. For more color and flavor garnish with thin slices of green onion. This dish reheats wonderfully in the microwave on a reduced power. This Dirty Rice is easy, scrumptious, and dependable. Put the ingredients on your shopping list and make you and yours an amazing meal. Your loved ones will be singing your praises. Other Cajun recipes you will love! Bring rice, 1 cup chicken broth, and water to a boil. Reduce to simmer, cover and cook for 15-20 minutes or until the liquid is absorbed. Remove from the heat and fluff with a fork. In large dutch oven or heavy stock pot over medium heat brown ground beef and ground pork. About halfway through the browning process add minced chicken liver, onion, celery and peppers. Cook until the meat is browned and the onions are soft. Reduce heat to low. Add garlic and Cajun seasoning and cook for 1 additional minute. Add the cooked rice to the pot with the meat and vegetables. Stir in 1/2 cup of chicken broth. Serve promptly. If your palate is sensitive add one teaspoon Cajun seasoning. 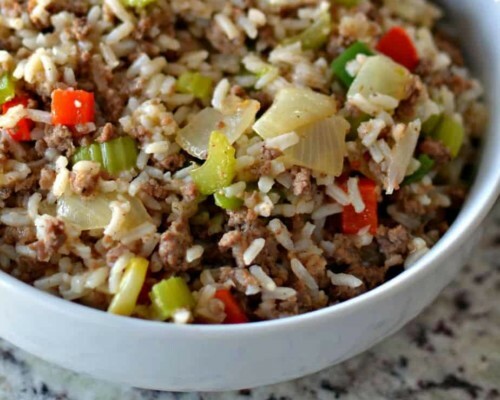 You can always add more when you add the cooked rice to the meat and vegetable mixture.